Many defined contribution plan participants have an investment and financial life beyond their retirement plan contributions. They have investments outside of their retirement plan, and they have a financial advisor who handles those investments. Spectrem’s new look into the habits and behaviors of DC plan participants shows how the relationship between a participant and their financial advisor plays out in the modern world of communication. Using Social Media and Mobile Technology in Financial Decisions asked participants the requirements those investors have of the website of their financial advisor. For what it is worth, investors prefer to get financial information and do research on the websites of trusted sources, and one such source is their primary financial advisor. There is a plethora of financial information available on the internet, but most investors go first to their financial advisor’s website, then check out other trusted media sites such as CNBC or Fox Business for the financial news of the day. But plan participants also use their primary advisor’s website as a tool for the daily accounting of their portfolio. In the Spectrem study, participants were asked to name the activities they want to be able to perform on their advisor’s website. The most popular choice (61 percent of participants) was access to their personal account information via a few clicks, just as they can do with their banking account or their DC account. The other appealing feature for participants from their advisor’s website is the ability to see all of their balances from multiple providers. Is that a service your website provides? Many participants are active participants in their investments beyond their defined contribution accounts. 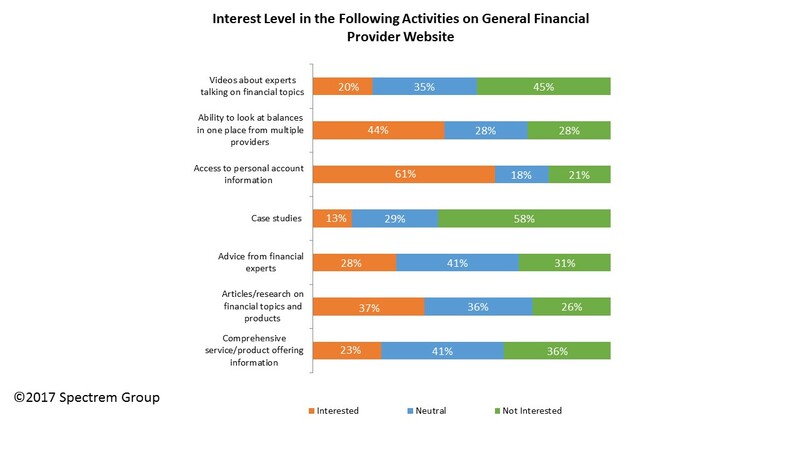 Thirty-seven percent of participants want to be able to read articles and look up background information on financial topics and products on their advisor’s website. Besides background articles, 28 percent of participants want to be able to see advice from financial experts on the events and trends which can impact their portfolio. The fact of the matter is that any information you might provide an investor in a face-to-face meeting is something plan participants have an interest in seeing on your website. There is actually a strong appetite for blogs as well, and advisors can offer blogs from a variety of sources on their website for participants to read. Asked to place their interest in financial blogs on a scale from 0-to-100, participants rated blogs on major financial media sites like CNBC at 51.92, and blogs on the site of their primary financial provider at 50.38. Those ratings indicate that information written in the relatively informal style of a blog resonate with participants who are trying to improve their portfolio. Blog reading is done more often by Millennial participants, which means that very new and inquisitive market of investors is looking for reading material, and are likely to be looking on your website, where you can direct them to products and services that could benefit both the investor and the advisor. (Male participants are twice as likely as female participants to read blogs, by the way). Plan participants are a subset of your clients who have specific interests in investments outside of their retirement account contributions. They are interested in a variety of financial topics, including those that could affect their defined contribution account as well as those which affect investments outside of their retirement savings. Be mindful of participants as an audience for the information you provide on your website, and address them directly when the subject matter is appropriate for that audience.